PARIS, France - High-performance sports cars are muscling greener competitors off the exhibition stands at the 2014 Paris auto show. With tighter environmental rules looming, this could be a final fling before the industry gets back to designing cleaner, more fuel-efficient, vehicles that some believe may be far less fun to drive, especially in an age of automated cars. Jeff Schuster, senior vice-president of forecasting at LMC Automotive, commented: "It's like some of the manufacturers are saying 'it's time to take a break and have a little fun'. Everything's been so serious, especially in Europe." Ferrari, Lamborghini, Bentley and Mercedes are unveiling new sports models in Paris - a marked departure from the 2013 Frankfurt show, where many of the production and concept cars had some form of electrification to help cut carbon emissions. Such automotive excess hasn't been seen at European auto shows in many seasons, Schuster said, and could be relatively short-lived, given the focus on cutting CO2. "It feels like Fat Tuesday. You know - the last big meal before Lent." That's not the case in Paris, where one of the showcase cars is the aptly named Bentley Mulsanne Speed, unashamedly billed as "the world's fastest ultra-luxury driving experience". The Mulsanne name comes directly from Bentley's roots in motorsport. Bentley, before it was acquired in 1931 by Rolls-Royce, won five of seven races from 1924 through 1930 at the Le Mans endurance circuit in France where race cars reach peak velocity on the track's Mulsanne Straight. Now the once impeccably Brit brand is owned (since 1998) by Volkswagen and has been slowly rebuilding its image as a purveyor of fast cars. The new Mulsanne Speed, expected to retail from the equivalent of R3-million, depending on specification, has a huge twin-turbo V8 engine that produces 395kW, enabling a top speed of 305km/h. 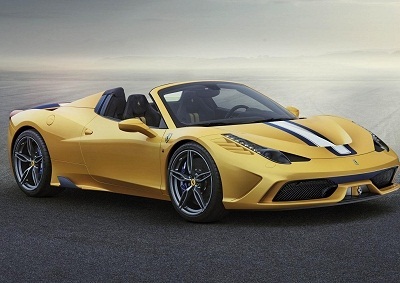 Sharing that same stratospheric automotive layer is Ferrari's 458 Speciale A, a limited-edition two-seater based on the Italian automaker's 458 Spider. Although pricing hasn't been announced (R3.1-million has been mooted) the word in Italy is that all 499 have been reserved by prospective and presumably very prosperous buyers. T Speciale and its 450kW V8 are capable of 320 km/h. Mercedes-Benz, if compared with the Ferrari and the Bentley, perhaps has more modest aspirations for its new Mercedes-AMG GT two-seater sports car that will be launched in 2015 (from the equivalent of R1.3-million) in two versions - a 340kW GT and a 375kW GT S. Top speed is projected as 310 km/h, which makes it look like something of a bargain compared to the Ferrari and Bentley. Lamborghini unveiled its Asterion concept car at the 2014 Paris auto show and called it "a technology demonstrator", meaning "no, it ain't for sale - yet". It's fast and green - sort of... a high-performance plug-in hybrid that has three electric motors and a 5.2 V10 engine together capable of 669kW and and 320km/h. The Asterion LPI 910-4 has a batteries-only range of 50km; top speed on batteries as 125km/h and fuel consumption is given as 4.12 litres/100km (combined cycle). The electric motors drive the front wheels.